I have a problem. But I know it’s a problem and I’m working on it. Each week is different, some weeks better than others. Some days it’s the pool. Well, most days it’s the pool. On Wednesday, it was the zoo, then the pool. Then a doctor’s appointment. On our way home from all these festivities, the 2 littler ones asleep…so I took advantage of this quiet moment and plopped down on the couch and crashed. At 5 pm. One hour, I slept. I bit off more than I could chew on Wednesday. In an attempt to burn all their energy, I spent all mine as well. The solution to my schedule problem is to have just enough planned that I burn all the kids’ energy…without burning all of mine. It’s tough to do in the hot summer months! But here’s what saved me…I started this in the slow cooker before we left for the zoo. Allowing me an hour’s rest from 5-6 pm without having to worry about dinner! Whew!! I love this chicken so much…for it’s flavor, and because of the fact that I was able to easily slip it into the slow cooker as we were having breakfast and working to get out the door….with sunscreen, water bottles, cups, snacks, baby/toddler supplies, etc. So most Apricot Chicken recipes call for onion soup mix. But I avoid them as much as possible….really I never buy them because I know that I can recreate the flavors with spices. Which is exactly what I did here with this one. I served this chicken over rice (because I’m still using up the 12# bag that I purchased for the 21 Gluten Free Meals from Costco plan!!!) with peaches. This would be a great meal to try on your next “chicken and rice” night…or for when you know you’re going to need an afternoon break from the kitchen! Place the chicken in the base of the slow cooker. In a small mixing bowl, combine the apricot jelly, dressing, minced onion and garlic. Pour over top of the chicken in the slow cooker. Set on low for 6 hours. Prepare rice or bread…whichever your preference. Season the cooked chicken with salt and pepper, to taste. 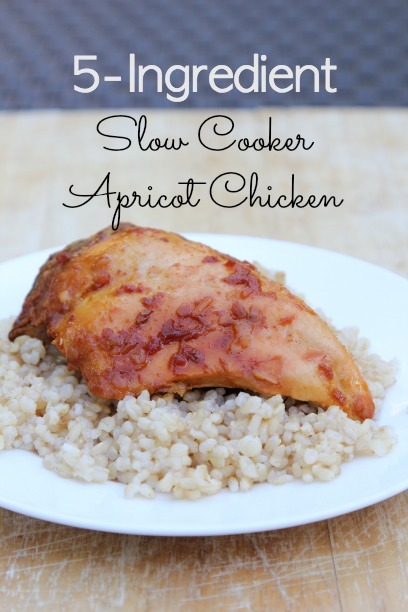 Serve Slow Cooker Apricot Chicken with favorite fruit or veggies, bread or rice. Just buy the bottle of French dressing from Walmart that’s .99 cents. Believe me you can obmit it but it won’t be the same at all. Much too sweet. I’ve loved apricot chicken since a church lady brought it to us when my sister was born… Twenty two years ago. I have been looking for a quick and easy recipe for apricot chicken and I came across this o e bout all the ingredients, but I’m a little confused about the french dressing comments above, as the french dressing I have got does not have anything tomato based in it does this matter? ?